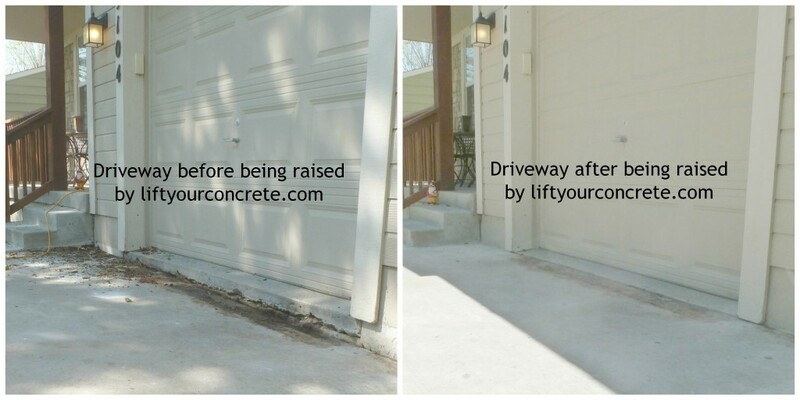 Driveway Repair, Concrete Leveling, Foam Jacking- Concrete Raising Sys. There are many ways to tell if a driveway repair is needed. Ignoring or avoiding is not recommended as some of these issues may worsen over time. It could take a few weeks, months or years. A sinking driveway can cause underlying issues for your basement or foundation. We advise that at the first sign of any of the issues below, you should call Concrete Raising Systems. Please know that waiting may make concrete leveling more costly. If the answer is yes to any of the questions below, call us for an estimate to repair your driveway. uneven by your garage or in the first 10 feet from the street? so uneven going into your garage that you have to give your car more gas to get in your garage? sunken by your garage door? below street level uneven, sinking or cracking? We could save you thousands of dollars in costly foundation repairs in the future. A sinking or uneven driveway by your garage door leads to cracks in the concrete which leads to foundation leaks and a wet basement over time. Water follows the path of least resistance. Sunken concrete and the cracks around it may be channeling water run-off from rain or snow to the foundation below your home through the gap created between the sunken driveway and your garage. Contact or call us for Driveway Repair at (816) 419-8306! Taking care of the problem when the gap is small is less costly than when the gap and the settling are larger. When you wait to fix any problem, it usually always means more expense and driveway lifting is no different. And with Concrete Raising Systems, our work is guaranteed for 2 years! If you think your driveway may be done settling, don’t wait! The sooner you do it, the less costly it will be. Be confident that choosing us for your driveway lifting if it settles more after we repair it, we will fix it for free! Your driveway is part of a system. When it was originally installed, it was poured over the soil and if the driveway is in a lower elevation than the rest of your home, water run-off from rain and melted snow finds its way into settled pockets of earth creating a vacuum effect. 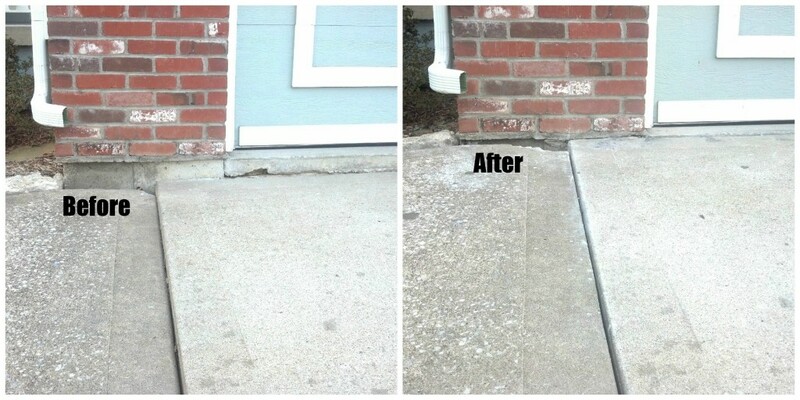 This vacuum effect pulls dirt away from the concrete creating a bridge under your driveway. This causes the cement slab to start to sink and settle. Go to our testimonials page to read what our customers are saying about our concrete leveling product. Read about our service! Our concrete leveling system will fill these spaces with an eco-friendly Polyurethane foam. It lifts the concrete in a matter of hours without the mess of mud and the cost of reseeding your lawn and landscaping around your driveway. Many traditional mud jacking jobs take days, even up to a week to complete. In fact, heavy equipment may be needed to complete the task, which can tear up your lawn around your driveway. Our driveway repair system is non-invasive.We can work in a small work space and only takes a few hours to accomplish. You can see the concrete leveling right before your eyes! The weather in Kansas City the last 5 years has been very dry. As a result, the dirt and soil is hard. The contractor who built your house brought in dirt for your driveway and packed it to lay the concrete driveway on. As a result, the dry soil was prone to not settling as well as it had in years past. As a result, your fairly new driveway may need lifting. In the last 2 years, there were 2 driveways that we simply could not repair. As a result, those customers were not charged. It took us three trips to get one driveway raised. If we can’t raise it, there is no charge! Don’t wait to till your driveway repair is more expensive than it needs to be. Contact or call (816) 419-8306 to use an eco-friendly foam from a local Kansas City company for your driveway lifting.